When Classics Become Legends. A statement for timeless design. The 70s: A golden age for BMW Motorsport. The spirit of these times has now returned. The BMW Motorsport Heritage Collection, inspired by iconic designs, lets you experience the drive of times gone by in every fiber. 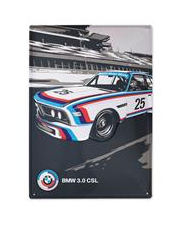 Shop and SAVE on the complete BMW Motorsport Heritage Collection Here!